Moscow (AFP) – The Communist candidate running against Vladimir Putin in this month’s presidential polls risks being barred over allegations he failed to declare Swiss bank accounts containing $1 million, Russian media reported Tuesday. Pavel Grudinin, a wealthy businessman, is currently running a distant second to Putin in opinion polls but his rating has grown as Putin’s has dipped. He has faced largely negative coverage in pro-Kremlin media. 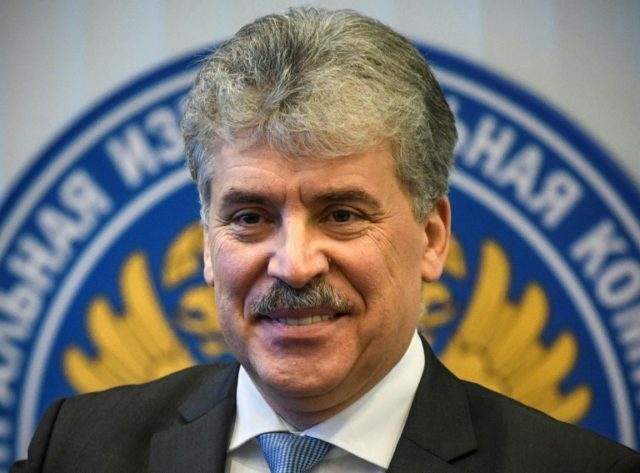 Central electoral commission officials have accused Grudinin of failing to declare and close all his foreign bank accounts before registering as a candidate in January, as required by law. The commission will decide on Wednesday what action to take. “Grudinin could be removed from the elections,” Vedomosti business daily wrote on its front page, quoting analysts who predicted this would seriously harm turn-out. Central Electoral Commission member Alexander Kinev told RIA Novosti news agency Swiss tax authorities passed on information that at the end of 2017 Grudinin had 13 accounts containing $1 million (800,000 euros) including 174 ounces (4.9 kilograms) of gold. Kinev and other officials told Russian media the commission had not seen bank documents confirming the closure of 11 of the accounts. “A million dollars and five kilograms of gold could cost Grudinin the elections,” reported Business FM radio station Tuesday. Grudinin in a message on social media late Monday condemned what he called “fake news” and said the party and Russia’s tax authorities had “exhaustive information” on the closure of all his foreign accounts. “I didn’t hide anything and carried out all the demands of Russian legislation,” he insisted. The crucial matter is whether Grudinin closed the accounts before submitting his bid, central electoral commission member Yevgeny Shevchenko told Vedomosti. If he did not, the commission could ask the Supreme Court to remove the candidate, Shevchenko said. Grudinin suggested the scandal was connected to his popularity as a candidate. As of February 26, 7.8 percent of Russians said they would back him, according to state pollsters VTsIOM. Meanwhile 69.1 percent backed Putin, down from 76 percent in December. “I get the feeling someone is very worried by the popularity of an opposition candidate,” Grudinin said on Facebook, hinting at Kremlin involvement. He vowed that he would not withdraw from the election.